As indicated by the title, we will discuss Rgua (1) and thin films (2, 3). For “Ruga”, I directly borrowed the opening introduction from previous Journal club “The Ruga mechanics” organized by Dr. Mazen Diab, Dr. Ruike Zhao and Prof. Kyung-Suk Kim. “The ‘ruga’, a Latin term, means a single state of various corrugated material configurations, which form diverse 2D-patterns on solid surfaces, interfaces and in thin films. Typical ruga configurations include large-amplitude wrinkles, creases, folds, ridges, wrinklons, crinkles and crumples.” Thin films are ubiquitous in nature and engineering structures, from nanoscale graphene films to millimeter scale polymer films, from centimeter scale clothes to kilometer space balloon and floating ice sheet (Fig. 1). In this club discussion, we will focus on the intersection between thin films and mechanics of ruga configurations, which definitely is only a subset of the thin film mechanics and ruga mechanics. Further, this discussion is motivated by our recent collaboration on instability of floating thin films with Dr. Joseph Paulsen in Physics department at Syracuse University. Therefore, I will start from the wrinkling, crumpling, and folding in thin films floating on water surfaces and use them as representative examples to explore the nonlinear coupling of gravity, surface tension, curvature, and bending deformation in determining various ruga patterns in general thin film structures. Figure. 1. (a) Wrinkles in a stretched graphene sheet (4), (b) torsion induced wrinkles in an annular graphene sheet (5), (c) wrapping liquid droplet with thin films (6), (d) folding of a floating thin film (7), (e) wrinkles and folds in cylindrical shell (8, 9), (f) wrinkles in clothes based on numerical simulations (10), (g) google balloon, and (f) floating ice sheet. Pictures in (g) and (f) are from internet. This is a long post, although I did not expect it at beginning. So I try to make each section self-contained. I only have a short time to prepare this club discussion, and will very likely miss some interesting and related studies. Please do point out these studies and participate in the discussion. Please also excuse typos in my writing. where B and K_eff represent the bending modulus of thin sheets and effective stiffness, respectively. For the stretched sheets, the K_eff comes from the tension stress. Another simple example is the liquid substrate, the stiffness is just K_eff=ρg. The scaling law in Eq. (1) is also applicable to solid substrate, the effective stiffness of which will depend on the wavelength (12). Figure. 2. (a) geometry and physics of wrinkling (11), (b) the curvature effect on wrinkles in thin films (13). where is the substrate’s stiffness (e.g., K_sub=ρg for a liquid substrate), σ_|| (x) and R_|| (x) are, respectively, the tensile stress and radius of curvature along the wrinkles, Et is the stretching modulus of the sheet, and Φ^2 (x) is proportional to the fractional length Δ absorbed by the wrinkles. We will review the applications of Eq. (2) in the following sections. Matteo and Dominic (14) further discussed the effective stiffness due to intrinsic curvature in spherical shell. Therefore, an important task of analyzing wrinkles becomes deriving K_eff in different situations, which depend on substrate (e.g., liquid or solid), stress field, and the curvature of wrinkles. We will highlight this question in a few set up and try to answer some of them. It should also be pointed out that the scaling laws in Eq. (1) and (2) are determined by local properties, which may not be always true. But these general relations between the wrinkles and material and geometry properties can still provide an important guide in analyzing the problems. 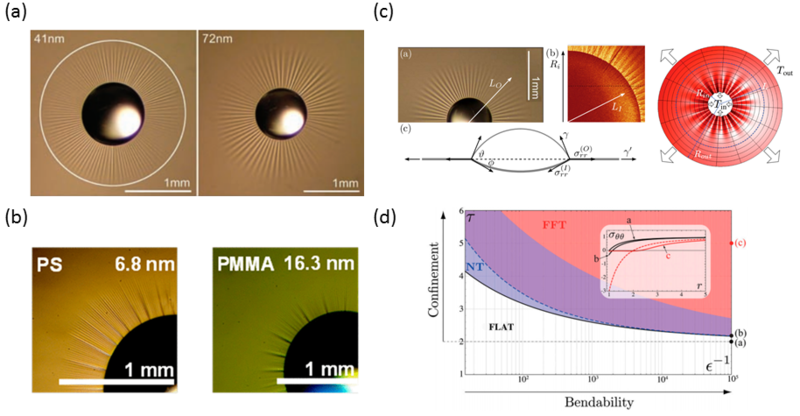 Huang et al., (15) show that wrinkles form when placing a droplet on top of a floating thin polymer film (Fig. 3a). A recent study by Chang et al., (16) further reveal complicated wrinkles (e.g., two Fourier modes) in very thin films (Fig. 3b). These wrinkles were found to be effective to measure the mechanical properties of nanoscale thin films. Schroll et al., (17) found that this droplet on film problem can be nicely formed as an annular thin sheet subject to tension difference on the inner and outer edge (Fig. 3c). This simple set up turns out to have very rich wrinkling behaviors, which cannot be described by perturbation theory and eigenvalue analysis for very thin sheets. Focusing on this far-from threshold regime, Benny et al., (18) propose a compression free theory and apply energy minimization method to derive a scaling law for the wrinkle number, which is governed by the so-called bendability ε^(-1)=(T_out R_in^2)/B (Fig. 3d). Figure. 3. (a) wrinkles in floating thin film induced by a water droplet (15), (b) more complicated wrinkles in floating thin film induced by a water droplet (16), (c) theoretical models for these wrinkles (17), (d) phase diagram of different wrinkles (i.e., near threshold and far-from threshold wrinkles) (18). Parallel effort has also been devoted to understanding the wrinkling, buckling and folding in a real annular sheet. Working with PDMS sheet, Pineirua et al., (19) created surface tension difference in the inner and outer boundaries of the annular structure by adding surfactant (e.g., liquid soap) to the water outside of the annulus (Fig. 4a). Their results showed the wrinkles (e.g., wavelength) are governed the gravity and can be well described by the universal scaling in Eq. (1). 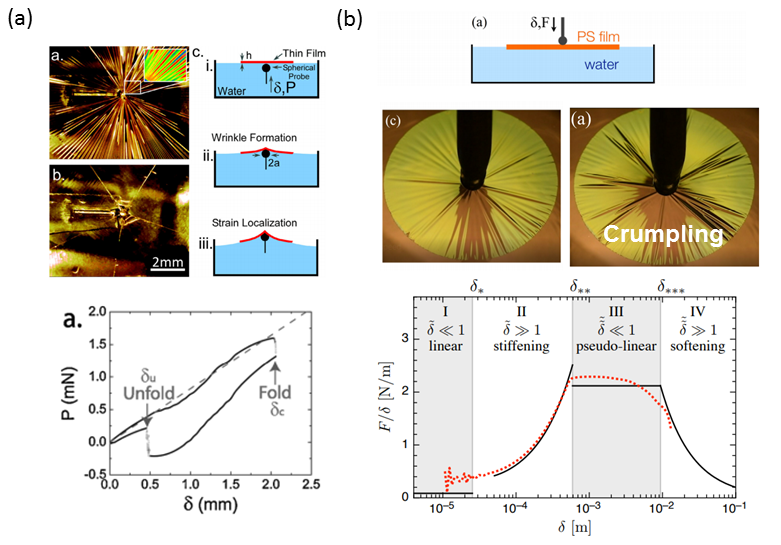 Paulsen et al., (20) applied a similar set up to very thin PS films and observed folding (Fig. 4b) and developed a geometry model to explain their findings. Although the wrinkle numbers were not directly measured, it is expected that the surface tension will play an important role and the structures are likely in the FFT regimes. Before we highlight a few open questions, we would like to point out the numerical challenges in simulating wrinkles in ultra-thin sheets. Taylor et al., (21) compared several numerical methods and found the dynamical relaxation method can give general very good results (Fig. 4c), although geometry perturbations are still required. Figure. 4. (a) capillary annular wrinkles in thick polymer films (t~10µm) (19), (b) capillary annular buckling and folding in thin polymer films (t~100 nm) (20), (c) numerical simulations for wrinkles in the FFT regime (21). a)We already can understand the two limiting cases: (1) gravity dominant wrinkles and (2) tension dominant wrinkles. However, there is still a lack of understanding of the general cases where both gravity and tension are important. b)Folding can happen in very thin annular sheets, but the exact transition from wrinkles to folding is still not known. c)The “two Fourier modes” wrinkles observed in very thin sheets are not fully understood yet. d)For such complicated wrinkle configurations, what numerical simulations will be better (Newton-Raphson method or dynamics-like method)? e)Either in experiments and simulations, do we only observe local minimum configurations? Let us take a look at another opposite set up by placing an initially flat thin sheet on top of a liquid droplet. King et al., (22) revealed the wrinkling and crumpling as symmetry-breaking instabilities in such as experimental set up (Fig. 5a-b). Except the bendability, the wrinkles are also influenced by another dimensionless variable, named as confinement α=YW/2γR^2, where Y is the stretching stiffness, γ is the surface tension, W is the radius of the thin film, and R is the droplet of the liquid. Bendability (ε^(-1)) and confinement (a) determine whether the wrinkles are in the NT or FFT regimes. Note that wrinkles in NT regimes can be generally understood from linear perturbation and eigenvalue analysis, while wrinkles in FFT usually far exceed the onset instabilities, and require post-buckling analysis. Paulsen et al., (13) successfully applied the universal scaling law in Eq. (2) to explain the wrinkle numbers in the film on droplet set up. In addition, they also compared the theoretical prediction with wrinkle numbers measured in a floating thin film under poke. Figure. 5. (a) wrinkles in film on a droplet (22), (b) the unwrinkled and wrinkled regions as a function of confinement (22), (c) Wrinkles in a floating thin film under poke (13). For poking a floating thin film, the resultant force is another very interesting quantity to measure and study, except for the wrinkling configuration. Holmes and Crosby (23) found the transition from wrinkling folding and also reported a force drop when folding happens (Fig. 6a). Hysteresis loop in force can also be seen. By carefully examining the geometry nonlinear deformation and wrinkle formation and evolution, Benny, Dominic and their collaborators (24-27) revealed several deform regimes that the force-indentation depth relations follow different rules. Very recently, my collaborators Joseph Paulsen and Vincent Démery, using experiments and geometry model, identified another nonlinear regime for large indentation, where the force is constant and linear proposal to the surface tension and film radius (28). Figure. 6. (a)Wrinkling and folding in thin film under poke (23)(b) 4 nonlinear regimes of force-indentation depth in floating thin films under poke (28). To better understand the different nonlinear deformation regimes in poking a floating thin film, we developed a lattice model to simulate the problem (28), where elastic thin sheets and liquid surface tension were described by a triangle lattice model (29) and a spring with zero-rest length (30), respectively (Fig. 7a). The gravity force was directly applied to the particles in the elastic sheet, F_g=v3/2 r_0^2 ρgz, where the force was only along z direction, and the coefficient represented the effective area of a particle in the triangle lattice model. For large indentation, the gravity force is applied to each triangle with tilt deformation taken into account. A typical wrinkling configuration of the film under poke is shown in Fig. (7b). Our numerical simulations and experiments can well capture the first three nonlinear deformation regimes, compared to previous theory (27) (Fig. 7c). More detailed analysis of the regime 4 will be posted on line very soon (28). Figure. 7. 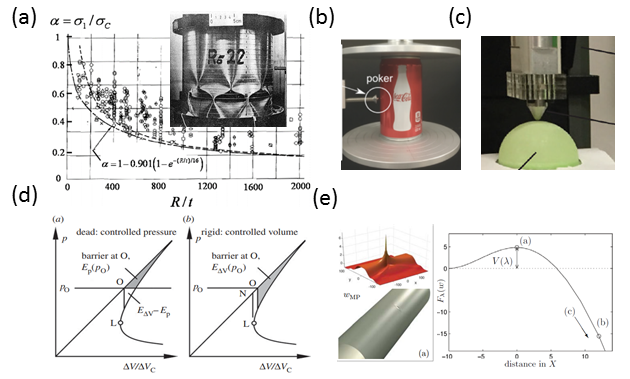 (a) Lattice mode for simulating floating thin film under poke, (b) Simulated wrinkle configuration, and (c) force-indentation depths from simulations and experiments (28). f)The coupling effects of gravity, tension, and curvature on wrinkle numbers, profiles, and system stiffness (resultant force). g)The roles of contact, friction, and adhesion in the folding of thin films. h)Our preliminary results show crumpling does not alter the force response, but why? Our previous discussion mostly focused on initially flat thin films, very rich wrinkling behaviors are also found in thin shells with intrinsic curvatures. Aharoni et al., (31) investigated wrinkles in a floating spherical shells (Fig. 8a), which is to overcome the geometry incompatibility. Albarran et al., (32) further extended the studies to more general curved shell with combined experiments and ABAQUS simulations (Fig. 8b). It should be noticed that surface tension does not play an important role in these two studies. Except the floating curved shell, a large number of studies have been conducted on the wrinkles/buckles of cylindrical (8, 9, 33-35) and spherical shells (36). Figure. 8. (a) wrinkles in a spherical shell laid atop a flat body of water (31), (b)more general studies on the curvature controlled patterns in floating shells (32), (c) cylindrical shell buckling (34), (d) surface texturing through cylindrical buckling (35), (e) wrinkling to folding transition in cylindrical buckling (9), (f) reversible patterning of spherical shells through constrained buckling (36). i)Will and how surface tension will modify the wrinkling patterns of floating shells? j)Some geometry models have been proposed to understand the patterning in cylinder and sphere under constraints, can one develop more sophisticated theatrical models for these patterns? A following up question of the curvatures is multiple stable configurations in thin films or shells. Even for the 1D floating thin film, Diaman and Witten (37) showed both symmetric and anti-symmetric solutions can exist in an infinite long system (Fig. 9a). Demery et al., (38) investigated the energy of the large fold in the same system with numerical simulations, and found the anti-symmetric folding has lower energy than the symmetric folding (Fig. 9b). Rivetti and Neukirch (39) studied the mode branching route to localization of the finite-length floating elastica (Fig. 9c). Figure. 9. (a)Exact solutions for wrinkling and folding in a floating thin film (37), (b) mechanics of large folds in interfacial thin films (38), (c) The mode branching route in a finite-length floating elastica (39). Figure. 9. (a)Exact solutions for wrinkling and folding in a floating thin film (37), (b) mechanics of large folds in interfacial thin films (38), (c) The mode branching route in a finite-length floating elastica (39). More structures with bistable or multiple stable configurations can be found in curved shells, bi-layer film with strain mismatch and metastructures, such as origami structures (40-46). Taffetani et al., (41) showed bistable configurations for a spherical cap (Fig. 10a). Chen et al., (42) demonstrated the bistablity in a pre-stressed bilayer structure (Fig. 10b). Silverberg et al., (43) revealed a bistability in origami structures due to hidden degrees of freedom (Fig. 10c). Chung et al., (44) showed that long cylindrical elastic plate can, when loaded appropriately, serve to store elastic bits, localized dimples and bumps that can be written and erased at will anywhere along it (Fig. 10d). Fu et al., (45) introduced a set of concepts for morphable 3D mesostructures in diverse materials and fully formed planar devices spanning length scales from micrometres to millimetres (Fig. 10e). Figure. 10. 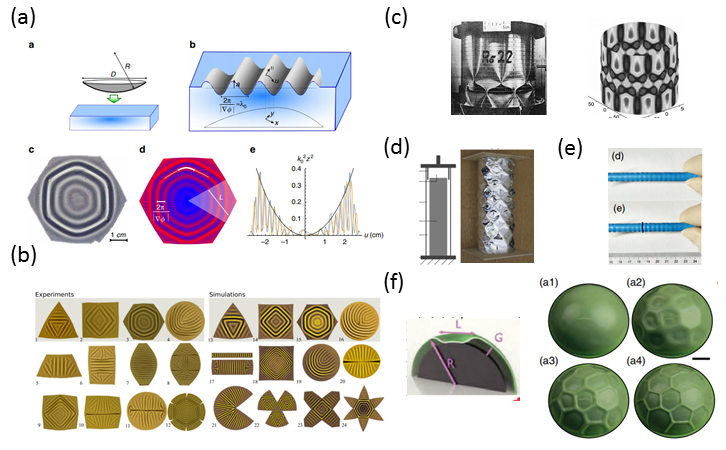 (a) static bistability of spherical caps (41), (b) bistable morphing structures based on pre-stressed bi-layer (42), (c) bistable origami structure (43), (d) reprogrammable braille on an elastic shell (44), (e) Morphable 3D mesostructures based on multisable buckling mechanics (45). One of the important applications of the multiple stability is to understand the knock-down factor of forces in cylindrical shell buckling (47, 48). It is well known that the maximum force a cylindrical shell can sustain is usually smaller than the theoretical prediction based on eigenvalue analysis (48), which is due to shell buckling and sensitive to imperfections. This geometry sensitivity can be attributed to the exist of multiple stable configurations, the energy barrier of which can determine the buckling stress (48). This classical problem recently attracts a lot attentions from both novel experiments and theoretical modeling. With a single local probe, Virot et al., (49) explored the energy landscape of the cylindrical shell under compression. Marthelot et al., (50) performed combined experiments and simulations to assess the shell instability via probing a hemi-spherical shell with point force. From the theoretical side, Horak et al., (51) applied the mountain pass theorem to search the energy barriers of cylindrical shell buckling. Hutchinson and Thomson (52) computed the energy barriers of a spherical shell with the framework of Maxwell load and identified the lowest the buckling load. Figure. 11. (a) Experimental data of the shell buckling stress (47), (b) poke of a cylindrical shell (49), (c) local probe of a spherical shell (50), (d) the Maxwell load method (52) and (e) the mountain pass theorem (51) for searching energy barrier in shell buckling. k)For a given structure, how can one predict the multiple stabile configurations? This is a question to find as many as possible local energy minimum configuration of a system with complicated energy landscapes. l)Suppose we can find the local minimum configurations, what are the energy minimum paths to move from one to another local minimum location? m)What are the new functions and/or devices we can achieve from these structures with multiple stability? n)Can we understand the geometry sensitivity in the buckling stress of shells with the information of energy barriers between different local minimum configurations? Most previous discussion focused on thin sheets/shells with geometrical nonlinear deformation. A substantial effort has also been devoted to study the wrinkles in highly stretchable thin sheets, where both geometry and material nonlinearities are important (53). Zheng et al., (54) used simulations and experiments to show that wrinkles can form and disappear in elastomer membranes under stretch (Fig. 12a). Nayyar et al., (55, 56) conducted experiments and modeling to understand the stress patterns and wrinkles in hyperelastic sheets (Fig. 12b). Taylor et al., (57) considered the finite strain effect on the wrinkle patterns in thin elastic sheets. Li and Healey (58) examined different hyperelastic model for the elastic thin sheets and computed the wrinkle evolution path via continuation for an inflated system (Fig. 12c). Zhang et al., (59) investigated the wrinkling patterns in soft spherical shell under poke with both experiments and simulations (Fig. 12d). Except for the pure elastic thin sheets, Feher found very interesting wrinkling behavior in highly stretched thin films with Mullins effect (60). Figure. 12. (a) FEM simulations of the formation and disappearing of wrinkles in elastomer membranes (54), (b) experiments on the wrinkles in hyperelastic thin sheets (56), (c) wrinkle pattern evolution in neo-Hookean elastic thin sheet (58), (d) wrinkling patterns in soft spherical shell under poke (59), (e) the Mulins effect in the wrinkling behavior of highly stretched thin films (60). o)Theoretical proof of the wrinkling in these highly stretched thin sheet is important, but challenging. p)What wrinkling behavior we can have in thin metal sheet with plasticity? q)The current FEM software (i.e., ABAQUS) can handle geometry and material nonlinear very well, but there seems still a lack of general and powerful tool for nonlinear instability problem and tracking the instability path. In addition, geometry imperfections are still needed for most simulations of post-buckling analysis. A question may be how to integrate the well-tested and robust FEM software with novel continuation methods for instability analysis? Thanks for reading this long post. You may wonder “Interesting patterns, so what?”. This is a tough question, but also very important. I try to answer it in a general and vague way. I think most of the studies can be summarized as “to wrinkled, or not to wrinkled”. Here I list two examples, and am sure there are many others. You are very welcomed to add to the discussion. Very recently, Chen et al., (61) showed the hierarchical micro-channels in Sarracenia trichome are keys for the ultrafast water harvesting and transport (Fig. 13a). We can see hierarchical wrinkles on the Sarracenia trichome (Fig. 13b). Wrinkles are myself interpretation, which can be wrong. Even they are wrinkles, they may be seen as films bonded on solid substrate, which is very important, but not discussed in the previous sections. I choose this structure mainly because it beautifully contains several key features discussed above: (1) varied curvature of the cone-like surface, (2) two or more Fourier modes wrinkles, (3) wrinkle bifurcation, likely indicating wrinkle number change. Figure. 13. (a) In situ optical microscope images of the Sarracenia trichome and its water transport process, (b) Appearance and surface wrinkled structure of the Sarracenia trichome (61). In some cases, we do not want to have wrinkles in thin sheets. One example is thin glass sheet produced by redrawing (Fig. 14a) (62-65). Filippov and Zheng (62) analyzed the dynamics and shape instability of these thin viscous sheets and used the elliptic and hyperbolic zones to define stable and unstable zones (Fig. 14b). Srinivasan et al., (65) determine the conditions for the onset of an out-of-plane wrinkling instability stated in terms of an eigenvalue problem for a linear partial differential equation governing the displacement of the midsurface of the sheet (Fig. 14c). Figure. 14. (a) example and modeling set up of a heated thin glass sheet during the redraw process (65), (b) theoretical model and maps of elliptic and hyperbolic zones (62), (c) eigenmodes of the midplane deformation (65). I am grateful to Joseph D. Paulsen, Halim Kusumaatmaja, Vincent Demery, and Timothy J. Healey for helpful discussion. 1. Diab M, Zhang T, Zhao R, Gao H, & Kim K-S (2013) Ruga mechanics of creasing: from instantaneous to setback creases. Proc. R. Soc. A 469(2157):20120753. 2.Witten TA (2007) Stress focusing in elastic sheets. Reviews of Modern Physics 79(2):643. 3.Audoly B & Pomeau Y (2010) Elasticity and geometry: from hair curls to the non-linear response of shells (Oxford University Press). 4.Bao W, et al. (2009) Controlled ripple texturing of suspended graphene and ultrathin graphite membranes. Nature nanotechnology 4(9):562. 5.Qin Z, Taylor M, Hwang M, Bertoldi K, & Buehler MJ (2014) Effect of wrinkles on the surface area of graphene: toward the design of nanoelectronics. Nano letters 14(11):6520-6525. 6.Paulsen JD, et al. (2015) Optimal wrapping of liquid droplets with ultrathin sheets. Nature materials 14(12):1206. 7.Pocivavsek L, et al. (2008) Stress and fold localization in thin elastic membranes. Science 320(5878):912-916. 8.Stoop N & Müller MM (2015) Non-linear buckling and symmetry breaking of a soft elastic sheet sliding on a cylindrical substrate. International Journal of Non-Linear Mechanics 75:115-122. 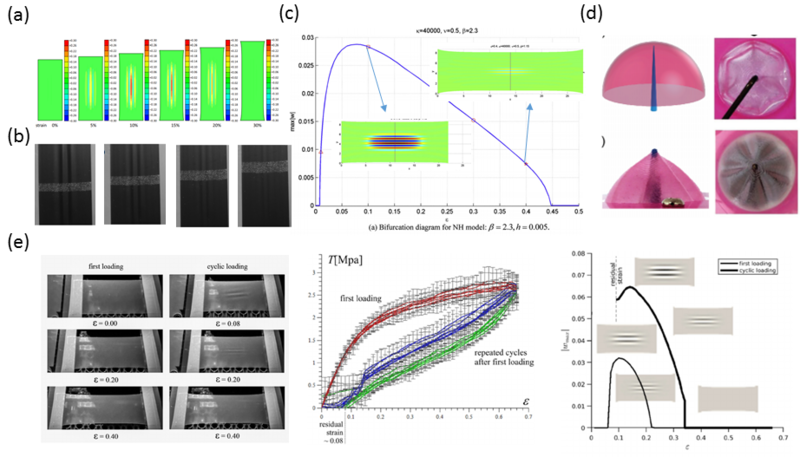 9.Yang Y, Dai H-H, Xu F, & Potier-Ferry M (2018) Pattern Transitions in a Soft Cylindrical Shell. Physical review letters 120(21):215503. 10.Jin N, Lu W, Geng Z, & Fedkiw RP (2017) Inequality cloth. Proceedings of the ACM SIGGRAPH/Eurographics Symposium on Computer Animation, (ACM), p 16. 11.Cerda E & Mahadevan L (2003) Geometry and physics of wrinkling. Physical review letters 90(7):074302. 12.Brau F, Damman P, Diamant H, & Witten TA (2013) Wrinkle to fold transition: influence of the substrate response. Soft Matter 9(34):8177-8186. 13.Paulsen JD, et al. (2016) Curvature-induced stiffness and the spatial variation of wavelength in wrinkled sheets. Proceedings of the National Academy of Sciences 113(5):1144-1149. 14.Taffetani M & Vella D (2017) Regimes of wrinkling in pressurized elastic shells. Phil. Trans. R. Soc. A 375(2093):20160330. 15.Huang J, et al. (2007) Capillary wrinkling of floating thin polymer films. Science 317(5838):650-653. 16.Chang J, Toga KB, Paulsen JD, Menon N, & Russell TP (2018) Thickness Dependence of the Young’s Modulus of Polymer Thin Films. Macromolecules. 17.Schroll R, et al. (2013) Capillary deformations of bendable films. Physical review letters 111(1):014301. 18.Davidovitch B, Schroll RD, Vella D, Adda-Bedia M, & Cerda EA (2011) Prototypical model for tensional wrinkling in thin sheets. Proceedings of the National Academy of Sciences. 19.Pineirua M, Tanaka N, Roman B, & Bico J (2013) Capillary buckling of a floating annulus. Soft Matter 9(46):10985-10992. 20.Paulsen JD, et al. (2017) Geometry-driven folding of a floating annular sheet. Physical review letters 118(4):048004. 21.Taylor M, Davidovitch B, Qiu Z, & Bertoldi K (2015) A comparative analysis of numerical approaches to the mechanics of elastic sheets. Journal of the Mechanics and Physics of Solids 79:92-107. 22.King H, Schroll RD, Davidovitch B, & Menon N (2012) Elastic sheet on a liquid drop reveals wrinkling and crumpling as distinct symmetry-breaking instabilities. Proceedings of the National Academy of Sciences 109(25):9716-9720. 23.Holmes DP & Crosby AJ (2010) Draping films: A wrinkle to fold transition. Physical review letters 105(3):038303. 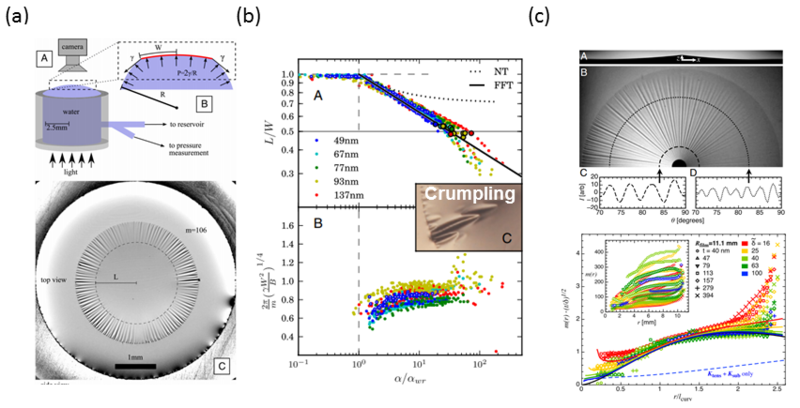 24.Vella D, Huang J, Menon N, Russell TP, & Davidovitch B (2015) Indentation of ultrathin elastic films and the emergence of asymptotic isometry. Physical review letters 114(1):014301. 25.Vella D & Davidovitch B (2017) Indentation metrology of clamped, ultra-thin elastic sheets. Soft matter 13(11):2264-2278. 26.Box F, Vella D, Style RW, & Neufeld JA (2017) Indentation of a floating elastic sheet: geometry versus applied tension. Proc. R. Soc. A 473(2206):20170335. 27.Vella D & Davidovitch B (2018) Regimes of wrinkling in an indented floating elastic sheet. arXiv preprint arXiv:1804.03341. 28.Ripp MM, Démery V, Zhang T, & Paulsen JD (2018) Geometric stiffening and softening of an indented floating thin film. arXiv preprint arXiv:1804.02421. 29.Seung H & Nelson DR (1988) Defects in flexible membranes with crystalline order. Physical Review A 38(2):1005. 30.Giomi L & Mahadevan L (2012) Minimal surfaces bounded by elastic lines. Proc. R. Soc. A 468(2143):1851-1864. 31.Aharoni H, et al. (2017) The smectic order of wrinkles. Nature Communications 8:15809. 32.Albarrán O, Todorova DV, Katifori E, & Goehring L (2018) Curvature controlled pattern formation in floating shells. arXiv preprint arXiv:1806.03718. 33.Wohlever J & Healey T (1995) A group theoretic approach to the global bifurcation analysis of an axially compressed cylindrical shell. Computer Methods in Applied Mechanics and Engineering 122(3-4):315-349. 34.Lord G, Champneys A, & Hunt GW (1999) Computation of localized post buckling in long axially compressed cylindrical shells. Localization and Solitary Waves in Solid Mechanics, (World Scientific), pp 271-284. 35.Seffen K & Stott S (2014) Surface texturing through cylinder buckling. Journal of Applied Mechanics 81(6):061001. 36.Marthelot J, Brun P-T, Jiménez FL, & Reis PM (2017) Reversible patterning of spherical shells through constrained buckling. Physical Review Materials 1(2):025601. 37.Diamant H & Witten TA (2011) Compression induced folding of a sheet: An integrable system. Physical review letters 107(16):164302. 38.Démery V, Davidovitch B, & Santangelo CD (2014) Mechanics of large folds in thin interfacial films. Physical Review E 90(4):042401. 39.Rivetti M & Neukirch S (2014) The mode branching route to localization of the finite-length floating elastica. Journal of the Mechanics and Physics of Solids 69:143-155. 40.Holmes DP (2018) Elasticity and Stability of Shape Changing Structures. arXiv preprint arXiv:1809.04620. 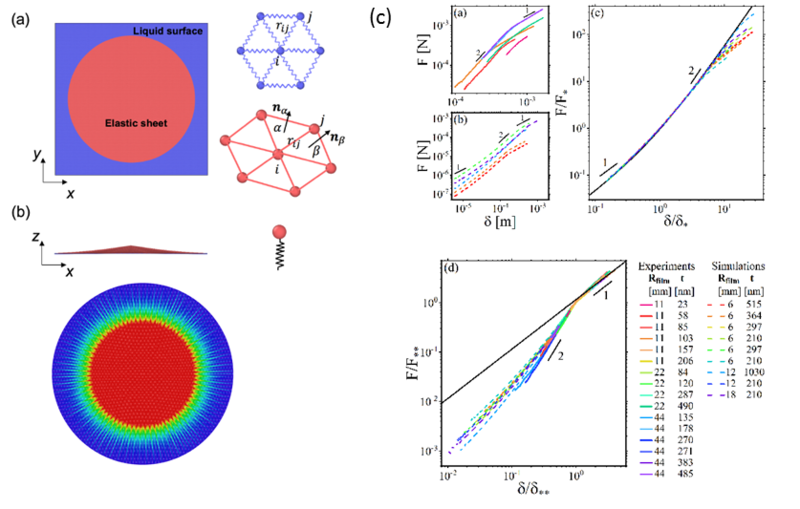 41.Taffetani M, Jiang X, Holmes DP, & Vella D (2018) Static bistability of spherical caps. Proc. R. Soc. A 474(2213):20170910. 42.Chen Z, et al. (2012) Nonlinear geometric effects in mechanical bistable morphing structures. Physical review letters 109(11):114302. 43.Silverberg JL, et al. (2015) Origami structures with a critical transition to bistability arising from hidden degrees of freedom. Nature materials 14(4):389. 44.Chung JY, Vaziri A, & Mahadevan L (2018) Reprogrammable Braille on an elastic shell. Proceedings of the National Academy of Sciences 115(29):7509-7514. 45.Fu H, et al. (2018) Morphable 3D mesostructures and microelectronic devices by multistable buckling mechanics. Nature materials 17(3):268. 46.Overvelde JT, et al. (2016) A three-dimensional actuated origami-inspired transformable metamaterial with multiple degrees of freedom. Nature communications 7:10929. 47.Seide P, Weingarten V, & Morgan E (1960) The development of design criteria for elastic stability of thin shell structures. (TRW Space Technology Labs Los Angeles CA). 48.Hutchinson JW & Thompson JMT (2018) Imperfections and energy barriers in shell buckling. International Journal of Solids and Structures. 49.Virot E, Kreilos T, Schneider TM, & Rubinstein SM (2017) Stability landscape of shell buckling. Physical review letters 119(22):224101. 50.Marthelot J, JimÃŠnez FL, Lee A, Hutchinson JW, & Reis PM (2017) Buckling of a pressurized hemispherical shell subjected to a probing force. Journal of Applied Mechanics 84(12):121005. 51.Horák J, Lord GJ, & Peletier MA (2006) Cylinder buckling: the mountain pass as an organizing center. SIAM Journal on Applied Mathematics 66(5):1793-1824. 52.Hutchinson JW & Thompson JMT (2017) Nonlinear buckling behaviour of spherical shells: barriers and symmetry-breaking dimples. Phil. Trans. R. Soc. A 375(2093):20160154. 53.Wong W & Pellegrino S (2006) Wrinkled membranes I: experiments. Journal of Mechanics of Materials and Structures 1(1):3-25. 54.Zheng L (2009) Wrinkling of dielectric elastomer membranes (California Institute of Technology). 55.Nayyar V, Ravi-Chandar K, & Huang R (2011) Stretch-induced stress patterns and wrinkles in hyperelastic thin sheets. International journal of solids and structures 48(25-26):3471-3483. 56.Nayyar V, Ravi-Chandar K, & Huang R (2014) Stretch-induced wrinkling of polyethylene thin sheets: Experiments and modeling. International Journal of Solids and Structures 51(9):1847-1858. 57.Taylor M, Bertoldi K, & Steigmann DJ (2014) Spatial resolution of wrinkle patterns in thin elastic sheets at finite strain. Journal of the Mechanics and Physics of Solids 62:163-180. 58.Li Q & Healey TJ (2016) Stability boundaries for wrinkling in highly stretched elastic sheets. Journal of the Mechanics and Physics of Solids 97:260-274. 59.Zhang C, Hao Y-K, Li B, Feng X-Q, & Gao H (2018) Wrinkling patterns in soft shells. Soft matter 14(9):1681-1688. 60.Feher E, Healey TJ, & Sipos AA (2018) The Mullins effect in the wrinkling behavior of highly stretched thin films. arXiv preprint arXiv:1806.00060. 61.Chen H, et al. (2018) Ultrafast water harvesting and transport in hierarchical microchannels. Nature Materials 17(10):935. 62.Filippov A & Zheng Z (2010) Dynamics and shape instability of thin viscous sheets. Physics of Fluids 22(2):023601. 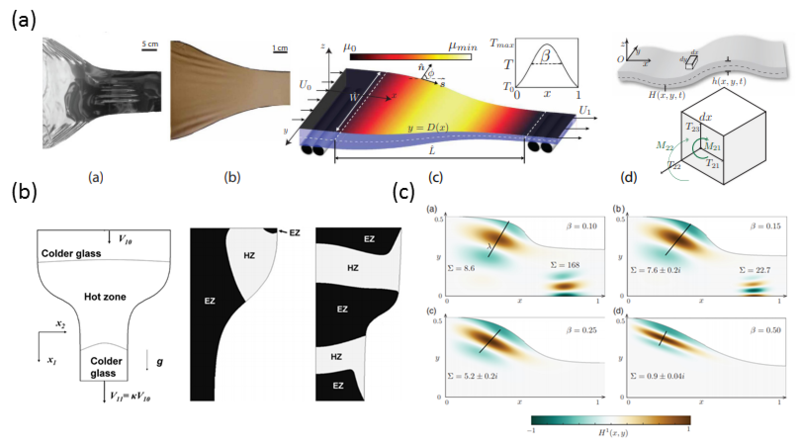 63.Perdigou C & Audoly B (2016) The viscous curtain: General formulation and finite-element solution for the stability of flowing viscous sheets. Journal of the Mechanics and Physics of Solids 96:291-311. 64.O'Kiely D (2017) Mathematical models for the glass sheet redraw process.). 65.Srinivasan S, Wei Z, & Mahadevan L (2017) Wrinkling instability of an inhomogeneously stretched viscous sheet. Physical Review Fluids 2(7):074103. Permalink Submitted by Jie. Yin on Wed, 2018-10-03 15:53. Great job! Thanks for the excellent summary on the ruga mechanics of thin sheets. The questions are very insightful. Wrinkling and folding of thin sheets with or without substrate (liquid or solid) is truely an intriguing topic with questions unsolved especially under the extreme case. Your post is mainly on involved highly nonlinear mechanics modeling and simulation of the complicated bifurcations. The last point on the application of these wrinkles or folds is a very good starting point for me to add some more about their interesting applications. I just listed two for references, which may miss some other related works. Q. Zhang and J. Yin, “Spontaneous buckling-driven periodic delamination of thin films on soft substrates under large compression“, J. Mech. Phys. Solids, 118, 40-57 (2018). Permalink Submitted by Teng zhang on Wed, 2018-10-03 22:29. Thanks a lot for sharing these very interesting applications. Indeed, the dynamically controllable surface morphology of these Ruga patterns provides a powerful means to achieve smart and multifunctional structures and devices. I found your studies on the buckling-driven periodic delamination of thin films very interesting. I also noticed that both your work and Vella et al show multiple or periodical delamination of thin films on a solid substrate, while Wagner and Vella reported a more localized delamination pattern for a liquid substrate. We already see large (localized) folds tend to develop in floating thin film even without delamination. Then, can we say post-buckling for thin films tend to be more localized on liquid substrates than solid substrates? A following up question maybe if you use a very soft solid substrate, will you observe a longer wavelength of delamination or see localized modes? Vella, Dominic, José Bico, Arezki Boudaoud, Benoit Roman, and Pedro M. Reis. "The macroscopic delamination of thin films from elastic substrates." Proceedings of the National Academy of Sciences 106, no. 27 (2009): 10901-10906. Wagner, Till JW, and Dominic Vella. "Floating carpets and the delamination of elastic sheets." Physical review letters 107, no. 4 (2011): 044301. Thanks for the wonderful summary and insightful questions! Permalink Submitted by Yihui Zhang on Wed, 2018-10-10 05:10. Thanks for initiating this wonerful discussion! The questions raised along each sub-branch of ruga mechanics are very profound and inspiring. Your post covered the effects of gravity, surface tension, liquid, curvature on the wrinking/folding configurations. Interface engineering might be another interesting aspect in the ruga mechanics. Active engineering of interface conditions can affect directly the buckled state of hard thin films on a soft substrate, e.g., the film delamination that leads to the transition of wrinkling to folding. Together with the strategical patterning of thin films, the heterogenously engineered interfaces are promising to enable the formation of new configurations of wrinkling/folding. It seems such an interaction between interface engineering and ruga mechanics has not received so much attention, but this is possibly a promising sub-area to explore. Permalink Submitted by Teng zhang on Wed, 2018-10-10 08:35. Great point. I totally agree with you that the active engineering of the interface can greatly enlarge the achievable configurations of the buckled structures. I am really impressed by the beautiful 3D structures guided by compressive stress in your group with Prof. Yonggang Huang and Prof. John Rogers. I was wondering how did you design the 2d planar sheet and also how to choose the adhesive sites for a specific target shape? Is it possible to find the design patterns through some optimization methods to achieve the targeted 3D buckled structures? Permalink Submitted by Teng zhang on Wed, 2018-10-10 14:39. The kids love to play this demo in the event. It is so simple that I can do it with my daughter at home. The demo of tapes on balloons follows a scientific paper by Concha et al. , who used the painting on an inflated balloon and observed wrinkles. For the tapes we used, we mostly see delaminations. As Jie pointed out in his comments, periodical buckling delamination patterns have been observed and modeled in flat structures [2,3]. This simple system may serve as a prototype model to explore the effect of curvatures on the buckling delaminations. 1. Concha, A., McIver III, J.W., Mellado, P., Clarke, D., Tchernyshyov, O. and Leheny, R.L., 2007. Wrinkling of a bilayer membrane. Physical Review E, 75(1), p.016609. 2. Vella, D., Bico, J., Boudaoud, A., Roman, B. and Reis, P.M., 2009. The macroscopic delamination of thin films from elastic substrates. Proceedings of the National Academy of Sciences, 106(27), pp.10901-10906. 3. Zhang, Q. and Yin, J., 2018. Spontaneous buckling-driven periodic delamination of thin films on soft substrates under large compression. Journal of the Mechanics and Physics of Solids, 118, pp.40-57. Permalink Submitted by Yihui Zhang on Wed, 2018-10-10 15:19. Thanks for your kind words, and for the good questions! The design of 2D precursor structure (including sheet pattern and location of adhesive sites) to achieve desired 3D configuration through mechanically-guided assembly represents an inverse problem. The solution of inverse problem is usually not unique, and one may find multiple possible solutions, especially when certain approximations are allowed. One of the strategy we have adopted is to exploit a 'structure-gene' database of 2D-to-3D mapping for > 300 different geometries to find a rough design, and then refine the design by slightly tailoring the geometries of 2D precursors. Optimization methods are definitely very useful in this type of inverse problem. My group has pursued a genetic algorithm to find 2D ribbon structures that can be assembled into targeted 3D ribbons. Prof. Xu Guo's group from Dalian University of Technology has published an article in EML (Vol 15, 139-144, 2017), reporting a numerical approach to solve the inverse kirigami design of cut patterns in the framework of topology optimization.